This year was a year of differences, however, our work of witness at the three major national festivals is constantly rooted in worship and fellowship. 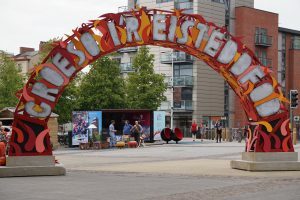 The first difference was that we had a new Faith Order and Witness Enabler, Peredur Owen Griffiths, coordinating our presence at the three major national festivals. The second difference was that the Urdd Eisteddfod was held on the Royal Welsh Agricultural Showground. It proved to be as busy as always providing a platform for the work of partners such as the Welsh Sunday School Council and Open the Book. The bonus this year was that our friends the RAWS Chaplains were working alongside us for the week. Many children came to the tent and regaled us with their favourite stories from the Bible. Cytûn worked closely with the rural chaplains and others to ensure that the churches had a strong presence at the Royal Agricultural Show. Our continuing partnership was signified with the signing of a new Partnership Agreement that will help further develop the work of the Chaplains on the Showground. Many of our member churches and groups had a visible presence in the tent and we are grateful them all for their support. Once again, Cytûn helped to profile the work of the churches in the context of rurality. The final difference this year was at the National Eisteddfod in Cardiff. Even though the “Field” was different the Cytûn tent was a meeting place for all. With our neighbours Christian Aid, we enjoyed a wonderful week talking, learning, listening and worshiping together. 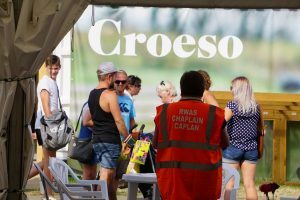 Many of the ecumenical groups that are members of Cytûn conducted the morning worship each day and without them and our member churches we could not have had such a successful Eisteddfod. With a year of differences behind us, we move on to a potentially more traditional year but remembering to learn from the experience of doing things differently.